"We're going to recapture my creatures before they get hurt…" Warner Bros has unleashed one more trailer from Comic-Con, this one for the upcoming Harry Potter spin-off Fantastic Beasts and Where to Find Them. We've already seen two trailers for this and a couple of featurettes, but this new trailer finally shows off some of the creatures (big and small) that Newt is trying to collect around New York. Eddie Redmayne stars as Mr. Scamander, a magizoologist. The full cast includes Katherine Waterston, Alison Sudol, Dan Fogler, Colin Farrell, Ron Perlman, Jon Voight, Samantha Morton and many others. They could almost starting selling this in a way similar to Pokemon Go, as Newt has to go all over New York and collect magical creatures. But seriously, this looks quite good, I'm pretty much ready to return to this world. Watch the very first trailer for Fantastic Beasts here, plus the two featurettes for the adaptation here + here. The adventures of writer Newt Scamander (Eddie Redmayne) in New York's secret community of witches and wizards seventy years before Harry Potter reads his book in school. A new spin-off series from the Harry Potter world, written by J.K. Rowling. 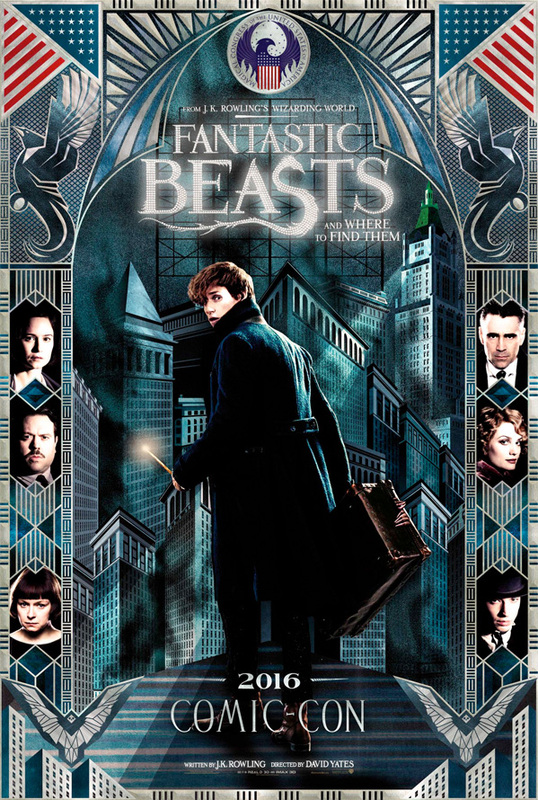 The first movie, Fantastic Beasts and Where to Find Them, is being directed by English filmmaker David Yates, director of Harry Potter and the Order of the Phoenix, plus Half-Blood Prince, and both Deathly Hallows two-part finale. The film features the American version of the Ministry of Magic, housed in the Woolworth Building in New York, known as the "Magical Congress of the United States of America (or MACUSA)". This looks fun. Warner Bros will release Fantastic Beasts and Where to Find Them in theaters nationwide starting on November 18th this fall. Looking forward to this? I am a little saddened this trailer made it look like Fogler is going to the "straight man" to the eccentric Newt. It should be the other way around. "Nomages" in the States. Rowling decided that each magical region uses a different set of jargon. Il like the color palette and the cinematography. I'm finally interested in this movie. I was never into Harry Potter or the world beyond finding out which Hogwarts house I'd be in, but I am finally looking forward to this movie. Great trailer. Just some vague plot points and lots of wonder, action and some humor, plus a great score.